The manager was in bullish form after watching his side draw 1-1 with Greece. Smuda believes his side can still progress to the next round. POLAND MANAGER FRANCISZEK Smuda played down the Euro 2012 co-hosts’ failure to start the tournament with a bang after they drew 1-1 with Greece, saying they were already focusing on Tuesday’s crunch match with Russia. “I congratulated all the players when they came off the pitch and I told them, ‘Cheer up, because it would have been much worse had we lost the game’,” Smuda said after Friday’s match in Warsaw’s brand-new National Stadium. Smuda, who was experiencing his first competitive match with the Poles as they have only had a series of friendlies being the co-hosts, said that the players had felt the pressure of playing at home on such a big stage. Goal scorer Robert Lewandowski was more downcast than in celebratory mood despite his 17th minute header showing the class he has displayed for German champions Borussia Dortmund. “We didn’t achieve the victory so for me it has no meaning if I scored the goal or it was someone else,” he said. With Smuda tipping Russia as Group A favourites, the Poles know they will have their work cut out in their next game, which has an extra edge because of centuries of bad blood between the two nations. “We need to be very focused, very concentrated, in order not to lose the game,” he said. After that game in Warsaw, Poland wrap up their group against the Czech Republic in the southwestern city of Wroclaw on June 16. “We’re just at the beginning and I think we’ll achieve our objective of getting through the group,” said Smuda. The Poles were dealt a blow by the loss of Arsenal goalkeeper Wojciech Szczesny, sent off for bringing down Dimitris Salpingidis in the box, and therefore suspended for the Russia game. “I don’t want to comment on the red card,” said Smuda. But substitute goalkeeper Przemyslaw Tyton, of Dutch club PSV, proved his mettle with his penalty save from Greek captain Giorgos Karagounis. “At his club, Tyton’s been really spectacular, so we know he can defend against penalties,” said Smuda. Greece had already been reduced to 10 men in the final minutes of the second half, after Sokratis Papastathopoulos picked up a second yellow. Meanwhile, Greece coach Fernando Santos on Friday said he was not satisfied with his side’s 1-1 draw with co-hosts Poland in their opening Euro 2012 clash despite coming from behind and at one point playing with 10 men against 11. The Portuguese coach – who replaced Otto Rehhagel after the 2010 World Cup when they exited in the first round – was not content because he said he had demanded a win and they had come up short. “I said we were going for a win so I am not satisfied,” said the 57-year-old. However, he was less than happy with Spanish referee Carlos Velasco Carballo’s decision to send off Werder Bremen defender Sokratis Papastathopoulos for a second bookable offence shortly before half-time. Papastathopoulos was adjudged to have brought down Polish midfielder Rafal Murawski. But television replays suggested contact was minimal and Murawski may have lost his footing, after pre-match rain lashed Warsaw. “I don’t think it was justified that Sokratis was sent off with two yellow cards. But still we succeeded in keeping the pressure on,” said Santos. “I totally accept the decision of the referee but it made it very difficult for us. Despite this, his inspired decision to send on Dimitris Salpingidis at half-time paid rich dividends as he scored six minutes later and indeed the coach admitted that his players had been more effective when down to 10 men. “We didn’t do a great job in the first 20 minutes… Poland were quick on the attack but we improved. We started to control the ball. We got into Poland’s half more then Sokratis was sent off. “We were confident on the pitch. We always thought we could get in the game again. The players were very good in the second half. The chance that went begging was a penalty from captain Giorgos Karagounis, which he had saved by Przemyslaw Tyton in his first touch after he replaced first-choice keeper Wojciech Szczesny, who also got on the wrong side of the Spanish referee with a trip on the lively Salpingidis in the 69th minute. Email “Euro 2012 reaction: Smuda upbeat, Santos disappointed”. 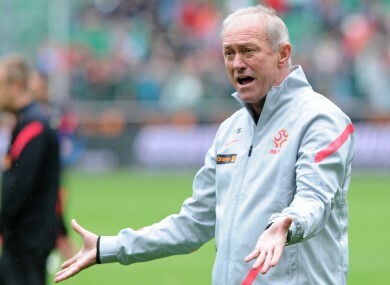 Feedback on “Euro 2012 reaction: Smuda upbeat, Santos disappointed”.